Today I'm here to share with you all the latest addition to my makeup stash, KOSÉ ESPRIQUE Bright lasting rouge in 3 new bold and vibrant shades. It's an all-on-one lipstick that provides serum, concealer and vivid color effects. Lipsticks are a must to complete my look daily, they help to bring out the mood I'm channelling for the day be it preppy, sultry or cheery. They definitely give a refreshing final touch before I head out! Aren't these colors already a joy to look at? And the quilted design gives a classy feel to the product appearance, a plus point! Here's how I matched the colors to my look during my Aussie trip last week! 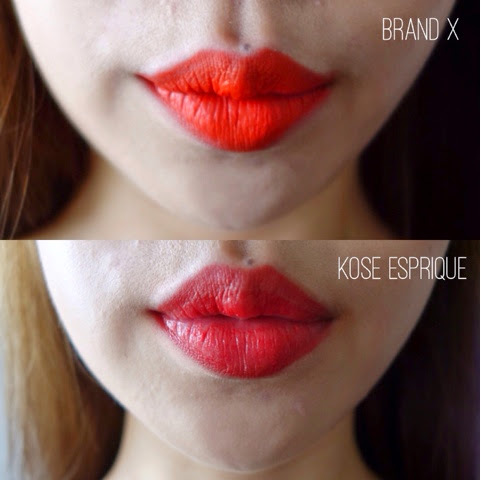 Finalizing my cheon song-yi inspired look with her signature orange lips with KOSÉ VIVID ORANGE. Amazed at how intense and bright the color is with just one single stroke! There's also the Shine effect that creates a film on the lips that captures moisture from the ambient air and gives a great shine. On another day, wearing CHERRY RED on me. Every color is so packed with pigment! The 'Vivid gel coat ingredient' creates a strong gel film when it comes in contact with moisture in the lips, also toning out the dullness in lip color, imparting the rouge's color as it is onto the lips. Puckering up with EXOTIC PINK. Major love to all these colors for brightening up my entire look the whole trip. The colors are also long lasting so reapplication was kept to a minimal, spared from the hassle of retouching every few hours! Comparing my current favourite lippie before I was introduced to KOSE ESPRIQUE. As you can see, I absolutely love the vibrant colour of brand X however it's exceptionally dry and is creating more visible lines on my lips as thou it's going to crack anytime. As I mentioned, KOSÉ ESPRIQUE Bright Lasting Rouge works as an all-in-one lipstick that provides serum, concealer and vivid color effects. The beauty serum effect provides lips with hydration, prevents chapping, dryness and moisture from escaping. With that, I no longer need to worry about dry chapped lips anymore! Another favorite other than the lipstick would be the ESPRIQUE Rouge Stay Magic. It features a lasting just-applied "color, shine and hydration" look. This non-sticky liquid essence has a color transfer prevention formula, so the color stays on all day too, just like the Bright Lasting Rouge! My only concern from now is on which to choose to wear out everyday, heh. 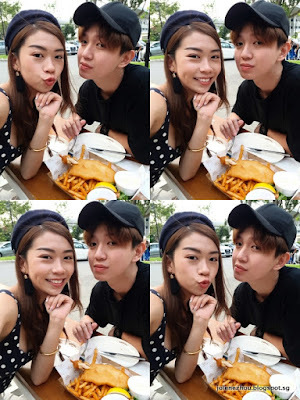 A lil something for you readers! Quote my name at Metro Paragon or Robinsons JEM KOSÉ counters and get a 3pc skincare sample kit for FREE! Purchase any new ESPRIQUE lip color at any KOSÉ counter island wide and you'll receive a free compact mirror! Time to go get pretty girls! Read more about KOSÉ and ESPRIQUE here!